The header and footer presets are great if they happen to match what you want to place there, but Word 2013 also allows you to create your own custom headers and footers that contain the exact combination of text and codes that you need. To do so, open the header or footer, click in it, and then type the text you want. Use the buttons on the Header & Footer Tools Design tab to insert codes. Open a Word 2013 document, double-click at the bottom of the first page to open the footer and move the insertion point into it. Select the page number that’s already there and press the Delete key. Press the Backspace key twice to move the insertion point to the left side of the footer. Choose Header & Footer Tools Design→Date & Time. 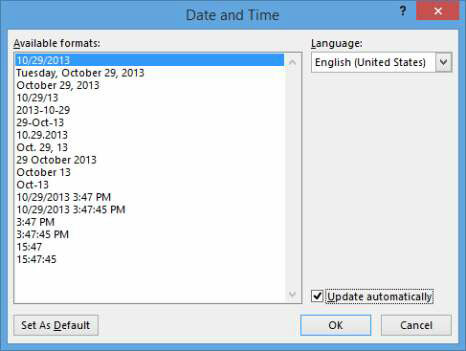 The Date and Time dialog box opens. Make sure that the Update Automatically check box is selected, click the first date format on the list, and then click OK.
A code for the date appears in the footer. You can tell it’s a code rather than plain text because when you point to it, it appears with a gray background. Right-click the date code and choose Toggle Field Codes. This lets you see the code that creates the date. Click in the date code and click the Update text that appears above it. The date code is updated and returns to showing the date itself rather than the code. Click to the right of the date code to move the insertion point there and then press the Tab key to move to the center of the footer. Type Lawrence College and press Tab to move to the right of the footer. The headers and footers have preset tab stops — a center-aligned one in the center, and a right-aligned one at the right. When you press Tab in Steps 8 and 9, you’re moving to those existing tab stops. Choose Header & Footer Tools Design→Page Number→Current Position→Plain Number. A page number code is inserted. If you’re curious about the code behind the page number, right-click it and choose Toggle Field Codes, as you did with the date in Step 6. Click the Toggle Field Codes button again to return to normal viewing. Choose Header & Footer Tools Design→Close Header and Footer and then choose File→Print and check the preview at the right. Notice that the codes in the footer produce today’s date and the current page number on each page. Click the Back button or press Esc to leave Backstage view without printing. In a complex document, you can get very fancy with headers and footers. For example, you can choose to have a different header and footer on the first page, and you can have different headers and footers on odd and even pages. That’s handy when you’re printing a double-sided booklet, for example, so the page numbers can always be on the outside edges. To set either of those options, select their check boxes on the Header & Footer Tools Design tab. You can also create section breaks, and have a different header and footer in each section. When you use multiple headers and footers in a document, you can move among them by clicking the Previous and Next buttons on the Header & Footer Tools Design tab. To adjust the header and footer size and positioning, use the settings in the Position group on the Header & Footer Tools Design tab. You can specify a Header from Top and Footer from Bottom position there. For example, if you want a taller header section, increase the Header from Top setting.